As the name suggest, radiant cut diamond is one of the shiniest cuts of diamonds because of its unique proportion and setting of 70 facets. First invented in 1977 by Henry Grossbard in an effort to bring together the best characteristic of the round cut with that of the emerald cut. The Square radiant cut diamond has distinctive brilliant cut facet pattern which is given to both the crown and pavilion, resulting into a striking and fiery square diamond. The rectangle radiant cut diamond comes with slightly cropped corners giving the entire diamond an unmatched sparkle and great fire. The very nature of this cut exudes a striking and radiant aura that never goes unnoticed and perfectly resonates with strong, energetic and bubbly personalities. The Trimmed corners of a rectangular radiant cut diamond gives it versatility and can be best combined with any type of jewellery, but particularly look most striking in a diamond engagement ring. With the best blend of elegance of emerald and brilliance of a round cut, rectangular radiant cut is an excellent choice for those are more inclined towards the regal panache of emerald cut but want the fiery brilliance of a round diamond. This is perhaps the most recent of the cuts invented to bring in a cut that would have the maximum brilliance. The radiant cut diamond first became popular in the 1980's. Created by Henry Grossbard in 1970’s, this brilliant cut altered the perception of rectangular diamonds. Earlier emerald and asscher cut with their simple faceted step cut were the only forms of rectangular shaped diamonds available. Radiant cut is the first rectangular cut with massive brilliance and fire. The distinctive cropped corners of the radiant cut is a remarkable fusion of round and emerald cut, that bring out a fire brighter than even round cut. With an intricate 62 to 70- facets, particularly the distinctive pattern on the pavilion and the crown, radiant diamonds emit remarkable brilliance. Further perfecting the cut, Radiant Cut Diamond Company launched its very own “original radiant cut” brand in 2002. Versatile in its contours and brilliant, a radiant cut diamond is perfect choice for those who appreciate the elegance of emerald cut diamonds and fiery sparkle of round diamonds. 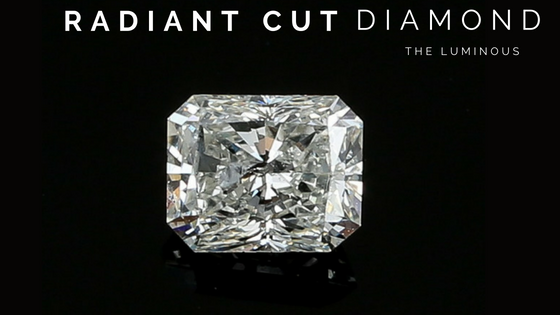 The unique shape of the radiant cut allows it to be versatile when it comes to the ratio, resulting in a square, near-square, or rectangular orientation. Square radiant cut diamond with its characteristic brilliant cut facet pattern creates an effervescent square diamond that looks quite similar to princess cut. The rectangle radiant cut diamond comes with slightly cropped corners that give it an exceptional sparkle and fiery brilliance. This versatile diamond cut with fierce sparkle goes well with any setting however, one needs to choose a setting that would complement and enhance the striking lustre by allowing the most light to enter the diamonds. It goes without saying that a solitaire diamond ring set in prong setting is the most ideal choice. However being a diamond with chipped corners a four prong setting is quite unsafe. It is best to have a 6 prong setting especially with longer rectangular radiant cut. The only trade off with six prong setting is that it hides the diamond more than 4 prong and might lead to dwindling of the sparkle. Any setting that is closed is not recommended as it hinders the light’s performance. Though not as popular as princess or cushion cut, radiant cut of recent times have gained popularity because of its versatility and its unique craftsmanship that brings out maximum brilliance from the rough stone. Celebs like Jennifer Lopez, Drew Barrymore, Khloe Kardashian, and Jessica Biel have been seen flaunting the striking radiant cut jewellery whether in form of diamond engagement ring or necklaces and pendants. RATIO : Most ideal length to width ratio for square radiant cut should be between 1 and 1.05. Most accepted ratio for a rectangular cut diamond is 1.15 or greater. Since radiant cut is not as popular as other brilliant cuts like princess and cushion cut, they have a larger pricing discount. Radiant diamonds are also one of those that have less wastage and hence price per carat is less. It is an excellent option for buyers who want the sophistication of emerald cut merged with the fierce sparkle of the round cut at a great value. In most of the cases premium price is associated with perfect length width ratio. 1.25 is considered to be the best ratio that demands a higher premium. Another factor that rules the premium of radiant cut diamonds is colour scale. A high grade colour are priced at a massive premium. Customers want the D-F color grades, and are prepared to pay a substantial prize to get them. Another factor that affects pricing drastically is carat. The price difference between different carats of radiant cut diamonds are humungous. Radiant cut diamonds with lesser carat weight are much cheaper and cost efficient. But once the weight reaches 2 carats, the prices skyrockets with every additional carat weight. The best advantage of a radiant cut diamond is that their striking sparkle masks the inclusion very well so a diamond with lesser clarity grade provides the optimal value at lower price.